Save Marinwood-Lucas Valley - our community, our future: Should Marinwood CSD build a Modular Garage like this and save $$$? Should Marinwood CSD build a Modular Garage like this and save $$$? Similar modular buildings are available for commercial uses. Much time and money can be saved with modular construction. 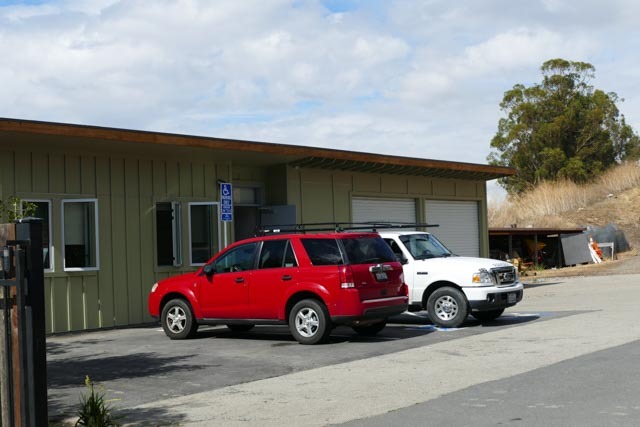 The above garage is approximately 640 square feet or the same as the 640 square foot garage that McIniss Park uses for their Staff building pictured below on the right. The McInnis office on the left is another 600 square feet. Staff building in McInnis Park for six employees. It is 1/3 of the size of the Marinwood Maintenance Compound. Their park is THIRTY TWO times the size of Marinwood Park.